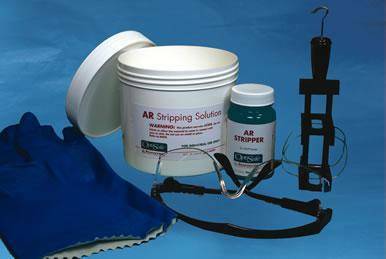 AR Stripper, from Phantom Research Laboratories Inc., is a stripping formula for removing Anti-Reflective (AR) coatings from plastic CR-39 lenses. Removing the AR coating is a simple cold dip and rinse process that takes 30 seconds to 3 minutes (depending on the type of AR coating) . Prepare the Stripping Solution in a plastic container using cold or warm tap water. Use the all-plastic lens holder to handle the lenses. Metal and glass materials are not compatible with the Stripping Solution and should not be used. We recommend using our AR Stripping Kit (Item #C493). 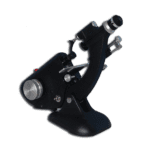 AR coated lenses are widely used and becoming increasingly popular. 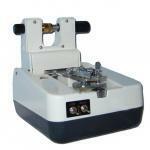 Optical outlets and labs should be equipped to remove these coatings. AR Stripper, 3 oz (85gm) bottle, Item #C495. Complete AR Stripping Kit, 1.1 lb (499gm), Item #C493. Pour the contents of the 3 oz (85gm) AR Stripper bottle into the AR Stripping Solution Container (32 fl.oz.). Add 24 fl.oz. (710ml) water. Mix all crystals until they are dissolved. Dip lenses, using the all-plastic lens holder, for 30 seconds. Remove and rinse.Refer to the instructions on the bottle and the MSDS.